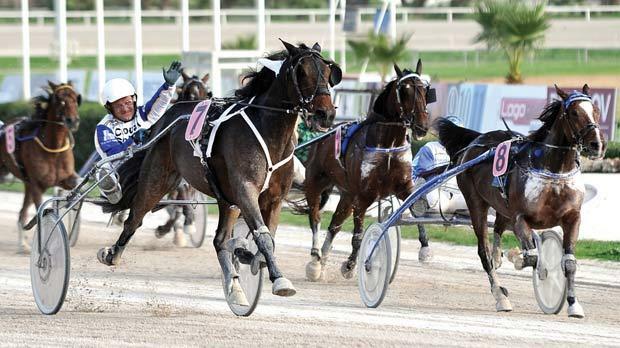 The three Prix De Vincennes semi-finals for French trotters coming from class Premier were the main attraction in yesterday’s 42nd meeting of the season at the Marsa Racetrack. Palazio Valterne, Pedro Vici and Oltedo De Rieux topped these races to cruise to the final of the competition organised by the Malta Racing Club in collaboration with the French Association Le Trot. In the first semi final, Palazio Valterne, under the guidance of David Ellul, secured its first win in Malta. This semi final was very exciting and the winner nosed ahead midway through the final straight. Palazio Valterne triumphed by a length and a half from favourite Pouloud Keroc’H (Chris Vassallo). Original Blue (Chris Cassar) and Pat De Fontaine (Noel Baldacchino) were the other trotters that progressed to the final. Favourite Pedro Vici (Johan Axisa) lived up to expectations in the second class Premier semi-final. Pedro Vici led for most of the distance and crossed the post first by two lengths from Okilaibo (Julian Farrugia) and Quillian Joyeux (Andrew Farrugia). Power Of Love (Michael Ellul) placed fourth. For Pedro Vici, the winner of the 2014 President’s Cup, this was its fourth win in a row. In the third class Premier heat, Oltedo De Rieux (Charles Camilleri) had to go all the way in the final 300 metres to stave off the challenge of Retroactif (Andrew Farrugia). Ourasi Diams (Redent Magro) and Quel Noir (Jesmar Gafa’) followed behind respectively in third and fourth place. This was Oltedo De Rieux’s second win of the season. Another meeting at Marsa will be held on Sunday, with the first race scheduled for 1.15pm.